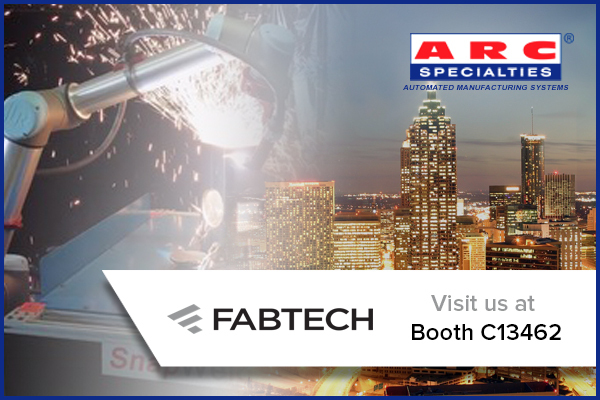 FABTECH 2018 is coming to Atlanta, Georgia, from November 6-8, and Arc Specialties is excited to be participating. FABTECH is North America’s largest metal forming, fabricating, welding, and finishing event. With over 65,000 square feet of exhibit space, housing more than 35,000 attendees and 1,500 exhibitors, it is the premier event for networking and staying abreast of trends in the industry. More than 130 educational sessions are available with targeted technical, operational, economic, and managerial topics to enhance your company’s business and production strategies. Arc Specialties will be showcasing some of its most impressive products at this year’s show. Tool Joint Robot will demonstrate how a turnkey robotic system can provide automation for a multitude of tasks. The system will use a robot to illustrate welding, material handling, post-weld inspection, vision-guided part picking, and marking. In addition, the team will showcase the ARC05HVT 2500, a horizontal-vertical tilting cladding machine, to perform live clad overlay welding of Inconel 680 & Inconel 625. SnapWeld and SnapCut will also reveal new technology that allows operators to interact with collaborative robots for easy programming of Mig Welding and Plasma Cutting. ARC Specialties furnishes one-of-a-kind machinery that utilizes unique experience and knowledge, especially in the areas of metal welding and cutting applications, material handling, pick-and-place machinery, and test equipment. ARC Specialties designs machinery that transforms your manufacturing process into a high-quality, high-production, and high-profit operation. The company is honored to participate in FABTECH 2018, an event in which the industry comes together to see what’s now, what’s new, and what’s next. Stop by Booth #C13462 and take a moment to get to know the team and see all that Arc Specialties brings to this growing industry. Learn more here about the customizable solutions that Arc Specialties can offer your company!